Sakai Guides and DocumentationSakai Complete User Guide WikiHow do I set wiki permissions? Wiki has two levels of permissions: site level and page level. 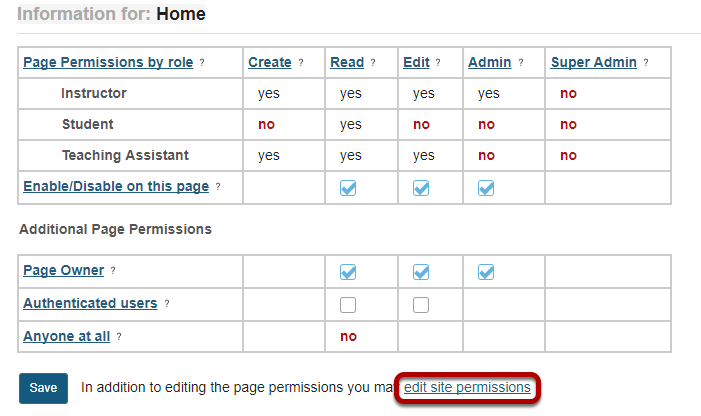 Site level permissions are the default permissions for all wiki pages. 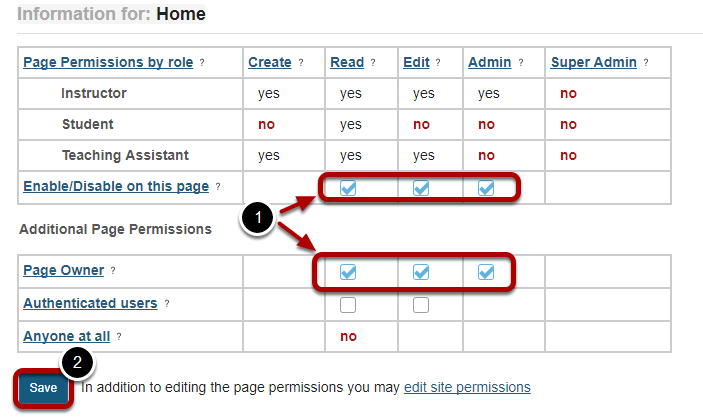 However, permissions can be also changed for individual pages at the page level. For example, you can alter permissions so that the wiki is editable by everyone, except for one page which can only be edited by instructors. Note: Wiki permissions cascade downwards. For example, you cannot update a page if you cannot read it, so it makes no sense to enable "update" but dis-enable "read". If you enabled "create" or "update", Wiki will assume that you want "read" permission enabled as well. Select the Info button to view the information for the page you are currently viewing. Check or uncheck the boxes available on this page to enable/disable the associated permissions for each of the user roles shown. Note: The permission options selected here will apply to the current page only. In order to edit the default permissions for all wiki pages in the entire site, click on the edit site permissions link just below the page permissions grid. Select the site level permissions for each role. Prev: How do I view wiki page history?